California election officials are launching a new effort to fight the kind of disinformation campaigns that plagued the 2016 elections — an effort that comes with thorny legal and political questions. The state's new Office of Election Cybersecurity will focus on combating social media campaigns that try to confuse voters or discourage them from not casting ballots. During the 2016 election, in addition to hacking email accounts and attacking voting systems, Russian agents also used social media to plant disinformation intended to drive down voter turnout. 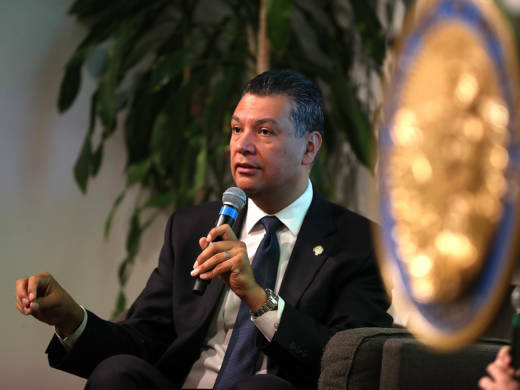 "People deserve to have confidence in our elections systems, and countering wrong information has become an important part of that," says Secretary of State Alex Padilla, a Democrat who's launching the office now with hopes of getting started before the November election. One widely circulated post in 2016 was an image of actor Aziz Ansari holding a Photoshopped sign urging Hillary Clinton supporters to save time by tweeting their votes from home. Another was an official-looking Clinton campaign graphic that urged supporters to "Vote from home" and to "Text 'Hillary' to 59925 and we'll make history together." It even included a "Paid for by Hillary for President 2016" disclaimer at the bottom. Other examples from 2016 included posts that directed voters to the wrong polling place or claimed the election was taking place on a different day. "This obviously wasn't true, and it violated voter suppression laws," says Bret Schafer with the Alliance for Securing Democracy, who tracks Russian influence operations on social media. One of the most frequent falsehoods planted in communities is that voters should not accept provisional ballots because they won't be counted, says Padilla. In fact, more than 90 percent of provisional ballots are ultimately counted. The new office, Padilla says, "allows us to be able to identify campaigns along those lines more quickly, correct information, and — as appropriate — work with social media platforms and others to bring some of that information down." Under a recently passed law, the office will "monitor and counteract false or misleading information" that could "suppress voter participation or cause confusion and disruption of the orderly and secure administration of elections." Social media companies, including Twitter and Facebook, are working with Padilla's office to create a process for reporting and removing disinformation. California is believed to be the first state to target disinformation this way. Schafer of the Alliance for Securing Democracy says it's an important step, but he warns the scope of this new office must be limited. "You don't want a secretary of state or any, really, government official being in a position for them to say, this specific narrative about a candidate is disinformation and it should be taken down," he says. "That very quickly is gonna be a slippery slope and it's gonna become political and problematic on many levels." When the California Legislature voted to create the new office last month, Republicans like Assemblyman Matthew Harper voted no. He argued a partisan elected official could seek to remove claims made by or against campaigns or candidates. "We should not give the secretary of state the authority to decide subjectively what is false or misleading information the election," Harper said during the floor debate. "If indeed this was about making sure to avoid situations in which someone was giving wrong information about when to vote, how to vote, etc., then it should have been specifically and narrowly tailored to that." The law is silent on the issues of how the office will handle false campaign claims and conspiracy theories, but Padilla insists they'll be off limits. Asked to categorically say that his office will not seek to decide whether a campaign claim is true or false, he replied: "Correct, correct." "I know in some quarters, there's some concern that we're going to get into the censorship business, which is not true," he said. "We support the First Amendment and freedom of speech. But it's also incumbent upon us to ensure that voters have correct, accurate information about voter registration and about being able to participate in the elections." For their part, the social media companies insist they are targeting disinformation about the voting process — not campaign claims. Facebook spokeswoman Brandi Hoffine Barr says partnerships with states, "including our ongoing work with Secretary Padilla, are a critical piece of our efforts to help prevent elections interference and the spread of false information on Facebook as well as encourage voter registration and participation in the upcoming elections."